Preferably, let's choose a weekday, definitively not the week-end, to visit the Sentier district, dedicated to the textile and clothing industry. Although heavily impacted by the relocation of the clothing industry, the activities around Prêt-à-Porter, developed after the Second World War and in the 1950s, have been maintained in Le Sentier. We are going to use many congested small and narrow streets, very busy during the week; we are also going to use several passageways built for the most part in the 18th and 19th century. The Sentier district is limited by boulevard de Bonne-Nouvelle to the north, boulevard de Sébastopol to the east, rue Réaumur to the south and rue Montmartre to the west. Already in Atget's time, this part of Paris was dedicated to the clothing industry and the production of fashion accessories. In this time, it was also the centre for the printing industry and the press, all gone away today; if you pay attention, you will still notice some marks and press names on few buildings. In the Middle Ages, it was the largest slum in Paris. Known as fief d'Alby, it was so dangerous and dirty that nobody entered the area, but the thieves and beggars living there. In 1784, a royal Edict decreed that the area be destroyed and replaced by a Fish market, to the great relief of the Parisians. However, this is not because this demolition was received as a piece of good news that the district took the official name of Bonne Nouvelle (which can also be the meaning of good news ...). The name of Bonne Nouvelle just takes its origin from the name of a chapel built in 1551 dedicated to the Annunciation. Boulevard de Bonne Nouvelle is following the line of the Charles V Walls built in the 14th century in replacement of the previous Philip Augustus wall on the right bank. When on their turn the Charles V walls between the Bastille jail and the gate of Saint-Denis were demolished, they were replaced by the boulevards during the reign of Louis XIV. At the beginning, the boulevards were just dirt roads lined with trees. Did you know that the name of boulevard has a military origin? In the past a boulevard was the flat summit of a defensive wall. 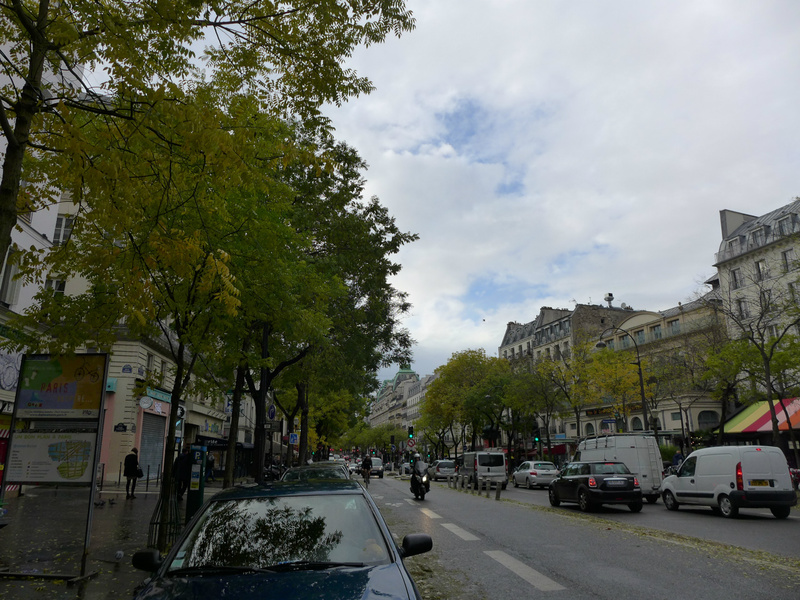 These boulevards, called the Grands Boulevards, stretch out over more than four kilometers between Place de la Bastille and Place de la Madeleine. After their creation, they rapidly became favorite Parisian walkways to be finally the utmost fashionable place to be in the 19th century. The Grands Boulevards have adopted the name and the style of the districts they cross; hence, boulevard de Bonne-Nouvelle has always been rather a working-class neighborhood due to rue Saint-Denis. On Atget's photo we can notice on the right the elongated facade of the Gymnase theater. When created in 1820 it immediately got success with the first vaudeville plays written by Eugene Scribe, as well with plays written by renowned writers like Alexandre Dumas, Balzac, George Sand, Sardou. To honor Marie Bell, her name was added to the theater name in 1958. Let's walk up to rue Poissonnière and turn on the left where the movie theatre Le Rex is standing. This giant art-deco building has some Broadway style with its neon signs and the large images projected on the impressive facade. 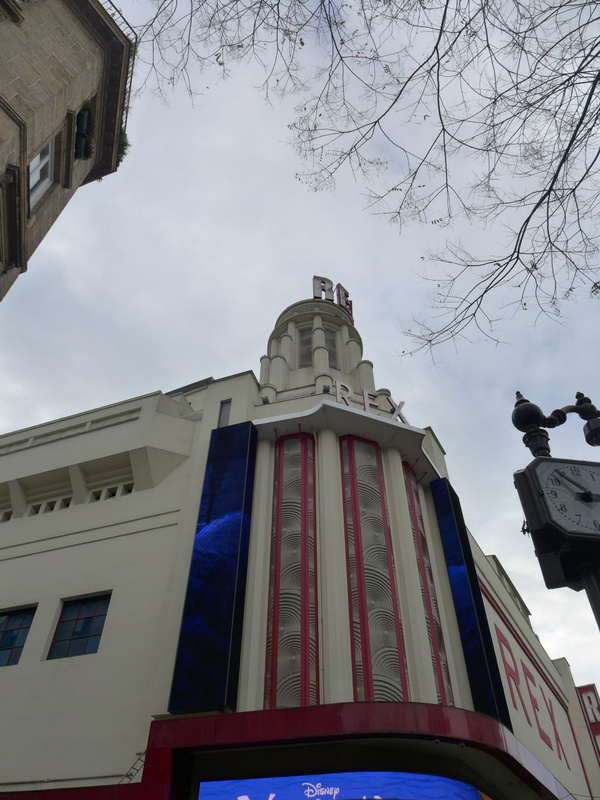 Its tower is also marking the boundaries between the Boulevards and the quite different Sentier district. The word “Poissonnière” meaning a woman selling fish is rather sounding vulgar in French. It does sound weird too in a district dedicated to the clothing industry and in the past to the printing industry … Its name reminds us that in the past it was a road used by the fishmongers coming from the north of France to sell the fish and seafood to the fish pavilion of the Parisian Halles, now out of Paris. Nothing today is bringing up the image of trolleys linking up the sea to the belly of Paris, it belongs to the past like at 21, rue Poissonnière the 17th century mansion and its elegant iron work photographed by Atget before its demolition in 1907. It has been replaced by an impressive neo-classical building with sculptures representing three severe man faces. Though the building is quite classical, it accommodates on its 1250 square meters an activity centered around data processing, which is today largely established in the Sentier district. On our way in rue Poissonière, we will see an elegant private mansion, the hotel de Noisy, located at 2. We will proceed rue des Petits-Carreaux, then on the left rue d'Aboukir up to Place du Caire. We arrive Place du Caire, where we can immediately notice the three giant heads representing the goddess Hathor which decorate the building giving access to the passage du Caire (2, place du Caire). Place and rue du Caire, named to celebrate Napoleon's Egyptian campaign, were built in 1798 where previously an old convent was located between rue Saint-Denis and the small rue des Forges. Other neighboring streets: rues d'Aboukir, d'Alexandrie, du Nil and Damiette remind as well the military and scientific Egyptian expedition. These streets were built where was before the biggest slum in Paris. This den of thieves and beggars has been well described by Victor Hugo in his book the Hunchback of Notre Dame. Because they were using a secret language, the Argot (slang), this group of thieves was named the Argotiers. Beggars in the day, they were using tricks to counterfeit the crippled, the blind, the epilectic (for this they were putting soap in their mouth to play hypersalivation), the leper … in the evening, back at their slum, they were removing their fake signs of disabilities, in an other word accomplishing a daily miracle, hence the name given to their district, the Court of Miracles. 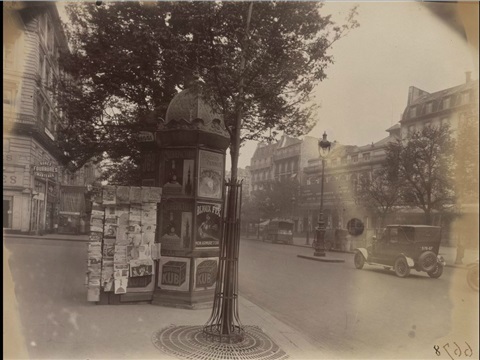 On Atget's photo, we can see several signs of printing companies above the passage. In his time, press and typography were an important activity and the printers were sharing the passage with the straw hat makers.